Weekend games by 6am on Game Day. We love animals! But they are not allowed at UTD. Please leave them at home. BEGINNING SATURDAY JULY 30th, THE NORMAL TATUM DR. ENTRANCE WILL BE CLOSED FOR CONSTRUCTION. 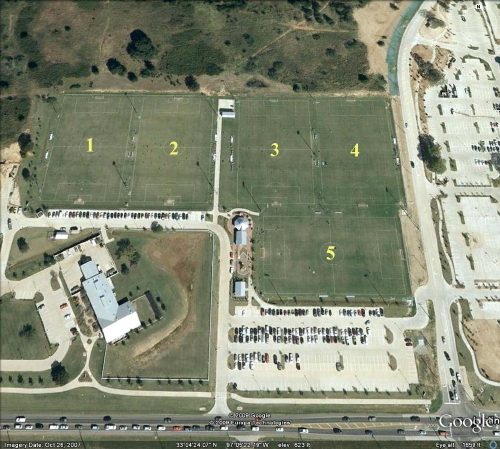 PLEASE USE THE ALTERNATE ROUTES OUTLINED IN THE MAP BELOW TO ENTER AND EXIT THE SOCCER COMPLEX AT UTD. ENTERING FROM WATERVIEW DRIVE: USE THE FRANKLYN JENIFER DRIVE AND FOLLOW LOOP RD SW INTO THE SOCCER COMPLEX. INTO LOT U. FOLLOW THE ROUTE OUTLINED IN THE MAP BELOW. PLEASE PARK IN LOT U ONLY! NO SOCCER PARKING IN LOT J. PLEASE RESPECT ALL UTD TRAFFIC LAWS AND BE ALERT FOR PEDESTRIANS. 8. No drop-offs at the Stop Sign adjacent to the lower and upper fields. 10. LOT J Parking by the Tennis Courts is off limits. No Parking at any time. 12. Please park in the designated areas only. You will be ticketed if you do not obey the UTD parking signs. 13. Parents and spectators sit opposite the player side. S Railroad at Bennett St.
1. All use of the fields must have prior approval from GLASA. No unscheduled play, free play or non-approved play is permitted. 3. Drugs and/or alcohol are prohibited within the park and in the parking lots. 4. Smoking is prohibited within the soccer park. 5. Pets are prohibited within the soccer park. 7. Goalkeepers may not "mark their posts" by creating marks on the field. 8. Jumping fences, defacing fences to gain entry/exit, deliberately kicking balls against fences is strictly prohibited. 9. No Parking on fire lanes - park in marked parking spaces only. 14. Everyone must leave fields when lighting detector sounds and cannot return till all clear is given. 16. No parking in the skateboard parking lot west of fields 5, 7 & 8. 1. All use of the fields must have prior approval from the City of Richardson. No unscheduled play, free play or non-approved play is permitted. MoneyGram Soccer Park reserves the right to assess a citation, fine, or penalty to any user of our facility (teams, leagues, or events) when any player therein is in violation of any of the following rules. All persons using the facility must abide by the lightning warning system in the event it sounds. No play will be allowed on fields in the event of severe weather or lightning. MoneyGram Soccer Park reserves the right to cancel any event at any time due to inclement weather or any other condition deemed detrimental to the soccer park. Gates to complex will be open/unlocked 30 MINTUES prior to game time or start time unless otherwise agreed to in advance. Players are NOT allowed on the field until the gates are unlocked. In the event that players arrive at the complex within 30 minutes of scheduled play and gates are locked, a phone number will be provided in advance to gain access to the facility. Unauthorized entry or jumping of the fence will result in team being fined accordingly. Jumping fences, defacing fences to gain entry/exit, deliberately kicking balls against fences, and/or anchoring tents, flags, etc. to fences is strictly prohibited. Warm-ups in goal mouths/18 yard box are prohibited (including goalkeeper). Goalkeepers may not “mark their posts” by creating marks on the field. Players and coaches must clear fields immediately following their scheduled usage. Lights are scheduled to go off 15 minutes following the scheduled finish time, unless otherwise agreed to in advance. Bicycles, scooters, inline skates, etc. will not be allowed on the fields at any time. Coolers are strictly prohibited within the field of play. Goals, nets, flags and/or benches may not be moved unless approved in writing by MoneyGram Soccer Park. Goal stakes may not be removed from goals. Stakes, nails, and pipes may not be driven in to the ground to hold up tents, team flags, portable goals, etc. All tents must be free standing tents and must be secured by sandbags or water barrels unless otherwise approved by MoneyGram Soccer Park staff. Signs and banners are prohibited, unless expressly approved by MoneyGram Soccer Park in writing. Signs and banners may not be affixed to any fences or gates. Signs must be taped to selected areas only, but the signs and all adhesives must be removed at the end of each day. Do not dig holes, tear up grass, disrupt landscaping, deface property, rip turf, or participate in any other activities that are destructive toward out facility. Do not deface any of our signs, statues, fences, or property. Fighting, cursing, excessive spitting, loitering, and any other behaviors deemed inappropriate are prohibited and are grounds for removal from the facility, or possible arrest. MoneyGram Soccer Park also reserves the right to remove any person(s) that is deemed to display abusive or uncooperative behavior. Drugs and/or alcohol are prohibited within the soccer park and in the parking lot. Smoking is only permitted outside the fenced in area. Grills, barbecues, fireworks, or anything involving flames or fire is not permitted anywhere within the soccer complex. Firearms and/or concealed weapons are prohibited. Pets, of any kind, are prohibited within the fenced area of the soccer park. Flyers and/or marketing materials of any kind in the soccer park or parking lots are not permitted at any time unless approved in writing by MoneyGram Soccer Park. Parking for MoneyGram Soccer Park events is permitted only in designated parking lots. Anyone parking in areas other than designated lots may be ticketed and/or towed. For MoneyGram Soccer Park events, parking lots will open 45 minutes prior to the first game. 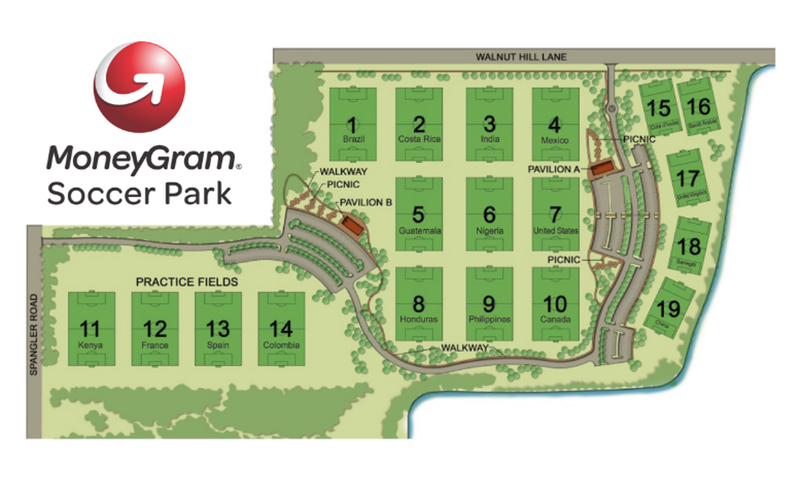 MoneyGram Soccer Park reserves the right to restrict and/or charge for parking in any parking lots at any time.